Manufacturer of a wide range of products which include pencil heater, cartridge heater with in built thermostat, industrial cartridge heaters with customized terminology, swaged cartridge heaters and cartridge heaters. We are offering Cartridge Heater Thermostat. We offer a variety range of Industrial Cartridge Heaters to our clients. 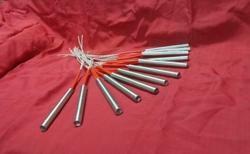 Being a noteworthy organization, we are engaged in offering Swaged Cartridge Heaters to our profound customers. We offer our customer customised as well as standard cartridge heaters with various diameters and length that varies with wattage and voltage.